If you want to know why you should rent a cabin when you visit the Smoky Mountains, just step into LeConte Bear Lodge. The spacious and inviting atmosphere of this cabin is sure to impress each guest in your large-group getaway. 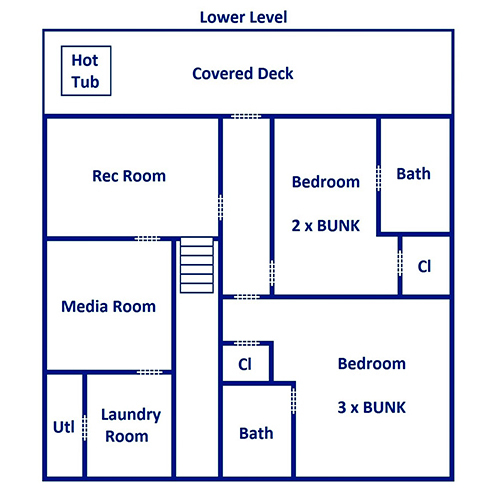 Ideal for family reunions, retreats, and multiple families with kids, it has space for up to 29 guests across 6 bedrooms and 6 1/2 bathrooms in the cabin. Besides king-size beds, these bedrooms feature twin- and full-size bunks. But comfortable sleeping accommodations are not the only thing you can look forward to inside LeConte Bear Lodge. You and your group will love the mountain views, outdoor hot tub, rec room complete with game tables and a mini fridge, private theater room, and community pool access in the spring and summer. Not to mention this cabin is located less than 5 miles from the excitement of downtown Pigeon Forge! 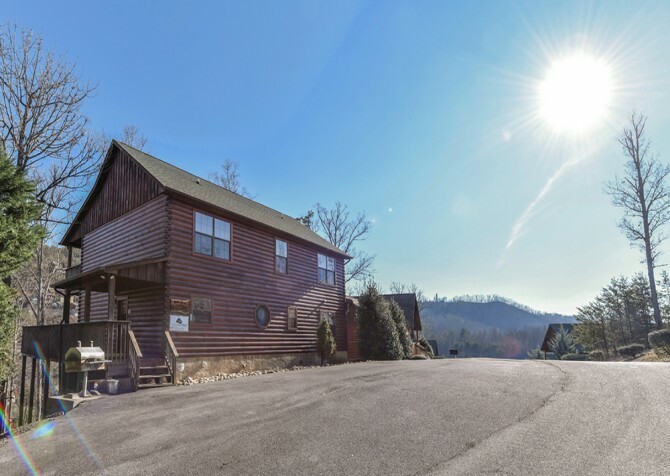 If you’re looking for a place to relax and have fun with all your closest friends, LeConte Bear Lodge is the right cabin for you. The LeConte Bear Lodge living room features high ceilings and large windows, creating an open and inviting space with tons of natural light. You’ll also find plenty of comfortable seating in this space, including a matching leather sofa and loveseat. Against another wall, you’ll find 2 oversized chairs upholstered in fabric that fits the Smoky Mountain motif; a large Smokies-themed area rug provides young kids with the perfect place to play and lounge on the floor. While the kids entertain themselves, the adults in your group are welcome to catch up on the news or a favorite TV show on the big screen TV mounted above the stacked stone fireplace. The fireplace is electric, making it easy to use on those spring and summer nights when the mountain air has a bit of a chill. And this amenity will prove a must-have for large groups visiting in the late fall or winter. Use the coffee table in the center of the living room for a variety of purposes—as a game table, a place for drinks or snacks, or even a place to set gifts if you’re hosting a holiday party during your Pigeon Forge getaway. In the LeConte Bear Lodge living room, you’ll also find end tables, reading lamps, and direct porch access to use at your convenience. If simple design and modern updates appeal to you, you’ll love the kitchen inside LeConte Bear Lodge. This space features modern updates like granite countertops, black-and-stainless-steel appliances, and sleek cabinets. Among the appliances, you’ll find all the necessities you would expect to find in your home away from home: a dishwasher, oven/electric stove, over-the-range microwave, and full-size refrigerator. Use these appliances to make easy meals for your group or to store/reheat leftovers after visiting Pigeon Forge favorites like The Old Mill Restaurant downtown. On the counter, you’ll also find smaller appliances like a coffeemaker. Don’t worry about missing out on your morning fix when you stay at LeConte Bear Lodge! Conveniently located beside the kitchen, the LeConte Bear Lodge dining room features a rustic wood table with a beautiful aged design. The rectangular table is relatively large, offering place settings for 8. However, this will certainly not fit your entire 29-person group. Not to worry! The design of this cabins leaves the living room and dining room open to each other, so extra guests can sit comfortably on one of the couches or plush chairs in the living room without feeling cut off from the group. Make use of the LeConte Bear Lodge dining table for group meals, holiday dinners, or a game-day buffet during your large-group getaway to the Smokies. 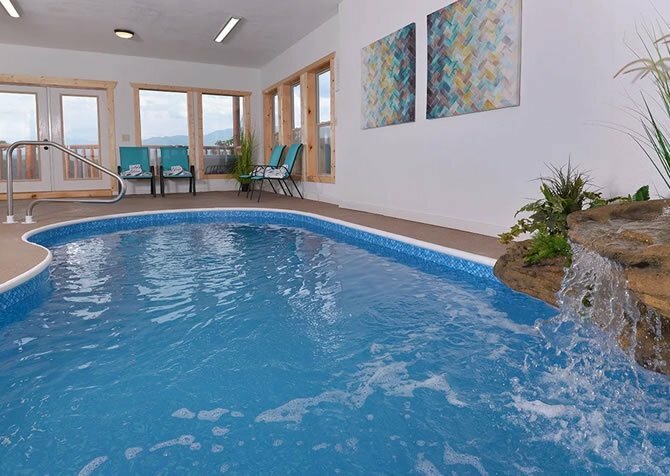 Even though downtown Pigeon Forge is only about 5 miles away from LeConte Bear Lodge, you don’t have to leave your cabin to find multiple ways to have fun during your stay. When it’s raining outside or you just feel like staying in your comfy clothes and hanging out with friends, head on over to one of 2 rec spaces inside the LeConte Bear Lodge. 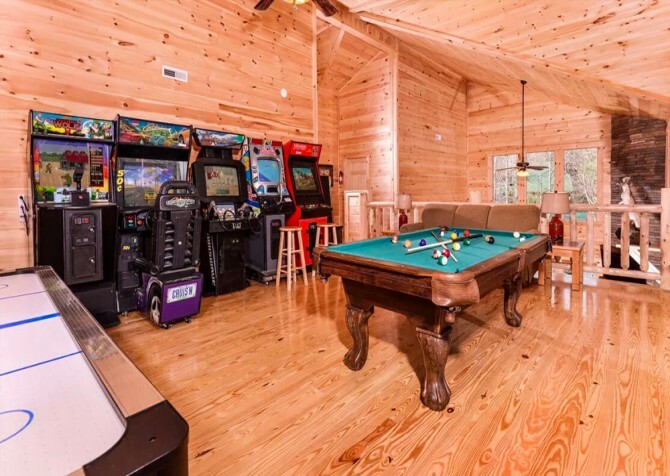 One exciting game room features an air hockey table, a basketball hoops game, and a table for board games or cards. The second rec space, which is even larger, features arcade games, a big screen TV mounted on the wall, a full-size pool table, and a mini fridge! For seating, you’ll find a full-size leather couch in this space as well as a round, pub-style table with 4 stools. 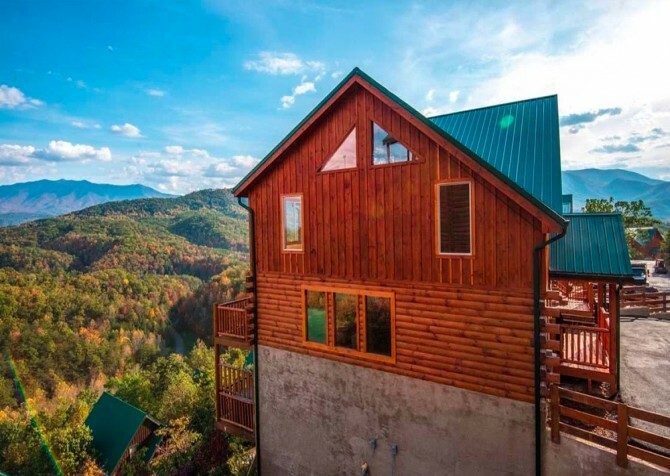 Shoot some hoops, find a favorite cartoon for the kids, or plan a poker tournament with your buddies in these fun and versatile spaces inside LeConte Bear Lodge! One of the best features of our large group cabin rentals is the variety of amenities you’ll find inside these cabins. In LeConte Bear Lodge, you’ll find not only a game room, a rec room, and plenty of deck space to hang out, but also a private theater room with room for almost half of your group! This space features 12 theater-style chairs with individual cup holders and raised seating to give that authentic movie-watching experience. With black walls and no windows, you’ll be able to watch your movies on the huge flatscreen TV mounted on the wall without distractions or even the tiniest bit of glare. So take advantage of the DVD player, Blu-ray player, and movie library during your Pigeon Forge stay. This is movie night done right with your large group in the Smokies! At LeConte Bear Lodge, you’ll not only find a variety of options for entertainment, but also plenty of places to get a comfortable night’s sleep. This 29-person cabin comes with 6 bedrooms and 6 full bathrooms, providing clean, cozy, Smoky Mountain¬–style accommodations for all your guests. All of the bedrooms feature log-style furniture, convenient extras like bureaus and ceiling fans, and individual TVs. 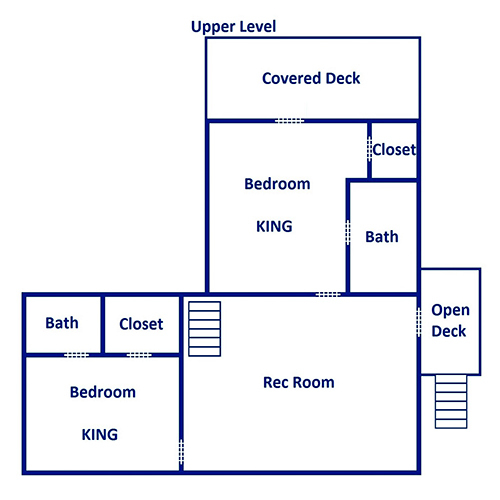 Four bedrooms come with king-size beds, and the other bedrooms offer twin/full bunks. LeConte Bear Lodge is ideal for multiple families traveling with their kids, family reunions, and youth/single retreats. 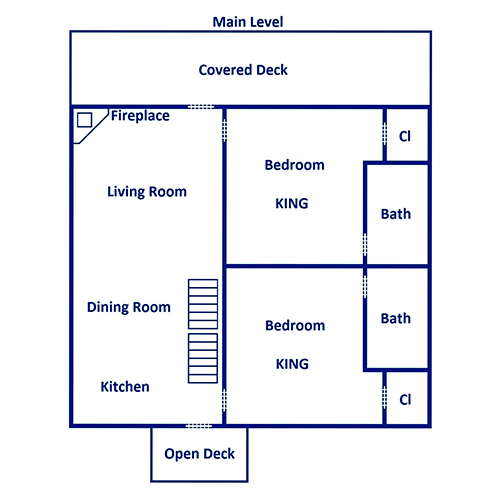 You’ll also find 2 sleepers and 1 futon for additional sleeping space in this large-group cabin. If you’re traveling all the way to the Smokies, why not stay at a place where you can enjoy views of the Smokies morning, noon, and night? LeConte Bear Lodge has all the right places for you to sit back and soak in these sights during your large-group getaway. This cabin features amazing mountain views right off the back porch as well as a line of rocking chairs to enjoy them from. Sit with friends or rock with your kids, and enjoy the sweeping views of the Smoky Mountains this cabin has to offer. On another level of deck, you’ll find additional rocking chairs, an end table for your fresh-brewed cup of coffee or refreshing glass of Smoky Mountain wine, and an outdoor hot tub with a privacy screen. Feel free to soak away stress while breathing in fresh mountain air during your retreat to LeConte Bear Lodge. As if the long list of amenities already provided isn’t enough, LeConte Bear Lodge continues to supply convenient extras like a charcoal grill, a paved driveway, high-speed wireless, 2 sleeper sofas, and a washer/dryer. For extra ways to relax and have fun, take advantage of the pool access provided by this cabin’s location inside the Sherwood Forest. There are also 2 indoor jetted tubs provided by this cabin. You won’t run out of ways to entertain and impress your guests when you stay at LeConte Bear Lodge! With everything from roller coasters to live music, Dollywood can please even the most diverse crowd. Kids of all ages—and adults, too!—with love this Southern-style theme park. During the spring and summer, pay a visit to Dollywood’s Splash Country. You’ll find the right mix of water rides and slides so everyone in your group can have fun while cooling down. Another perfect attraction for large group is Pigeon Forge’s The Island. With shops, restaurants, and rides, there’s plenty to do for a full day of fun with your large group in the Smokies. "The cabin was beautiful and had the best amenities! We couldn't have found a more perfect place to stay that met all of our needs. The staff was friendly and very accommodating, and the booking and check in process was so easy. Exceeded my expectations!" "My family and I really enjoyed this cabin. After grocery shopping, we really didnt have to leave the cabin...all sorts of entertainment. Movie theater, game room and awesome views from the mountains. Family time is the best. Loved every minute of our stay."